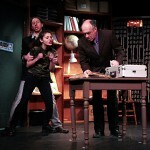 Three Mamet-esque con artists take on the ladies in a cutthroat battle of wits over a rare stamp collection. ERIC CLAVELL (Dennis) is excited to make his Hampton Theatre Company debut in this production with such a talented cast and crew. Regionally he has appeared in productions of THE PILLOWMAN, THE LARAMIE PROJECT, ROMEO AND JULIET, BEYOND THERAPY, BEAU JEST, A LETTER FROM ETHEL KENNEDY, BILOXI BLUES, BAD SEED, DINNER WITH FRIENDS and VERONICA’S ROOM. He would like to thank his family and his friends for all of their support. 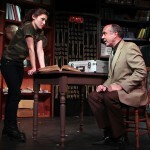 PHIL EBERHARDT (Sterling) last appeared on the HTC stage as Harry Roat, Jr. in last winter’s production of WAIT UNTIL DARK. 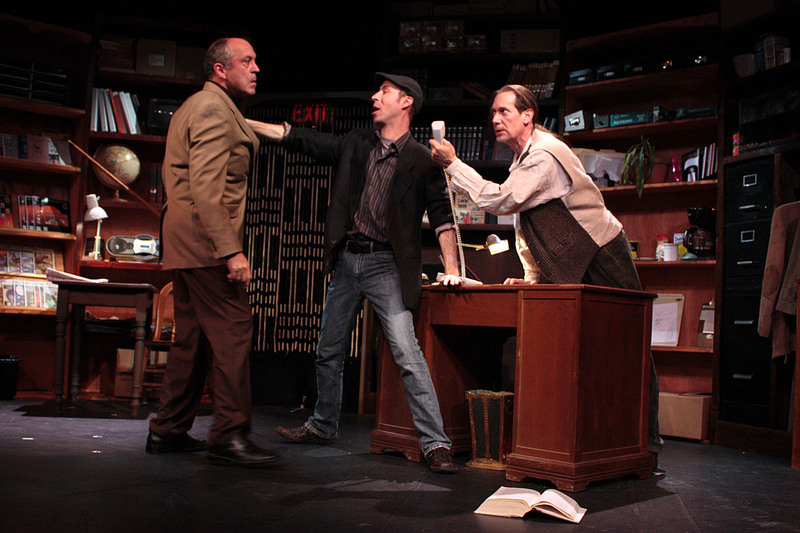 Other shows with the HTC include GLENGARRY GLEN ROSS, THE PRICE, NIGHT OF THE IGUANA, ABSURD PERSON SINGULAR, SOCIAL SECURITY, THE LAST NIGHT OF BALLYHOO, LADY WINDERMERE’S FAN and IT’S ONLY A PLAY. 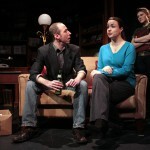 Phil holds a BFA in Acting from Boston University. When not working with HTC, Phil can usually be found behind the bar at the Stone Creek Inn. ANNA HEMPHILL (Mary) is thrilled to make her debut with the Hampton Theatre Company and thankful to work with such generous artists! Anna grew up in Virginia and received her acting degree from Christopher Newport University where she also became a certified Actor Combatant with the Society of American Fight Directors. She now lives in New York and has worked with Theater1010 in Manhattan and Florida Studio Theater in Sarasota, where she performed in the Under 6 Festival. Anna thanks her beautiful family, beloved Justin, and dearest friends for being her nightlight; and God for His abundant grace. 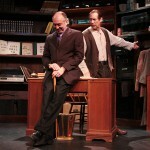 CHRISTOPHER LINN (Philip) has performed in theaters all over Long Island in 125+ productions over 40 years. Some recent appearances include Prospero in THE TEMPEST in Riverhead, Jaques in AS YOU LIKE IT in Greenport, Gandalf in Southampton Players’ THE HOBBIT and MacDuff in Guild Hall’s production of MACBETH. He gave highly acclaimed performances at Guild Hall as Cervantes/Quixote in MAN OF LA MANCHA and as George Hay in MOON OVER BUFFALO. Other favorite roles include: Ko-Ko in THE MIKADO, Scrooge and Marley’s Ghost in several productions of A CHRISTMAS CAROL, John Adams in 1776, George in WHO’S AFRAID OF VIRGINIA WOOLF, both Nathan Detroit and Sky Masterson in different productions of GUYS AND DOLLS. Chris was also a proud member of the Blackfriars Traveling Shakespeare Company and, in 2006, he won the title of “Long Island Elizabethan Idol” in a Shakespeare competition in Huntington. He is delighted to return to HTC, where some may remember him from LÉOCADIA, NIGHT WATCH, IT’S ONLY A PLAY, THE CRUCIBLE and PACK OF LIES. Love and thanks to Vicki for her support! THERESA REBECK (Playwright)’s plays include THE SCENE, THE WATER’S EDGE, LOOSE KNIT, THE FAMILY OF MANN, SPIKE HEELS, BAD DATES, THE BUTTERFLY COLLECTION, THE VIEW OF THE DOME and OMNIUM GATHERUM. Her play THE UNDERSTUDY has just finished a sold out run at the Roundabout Theater in NY and her latest, OUR HO– USE, opens this spring at Playwrights Horizons. Ms. Rebeck has also written and produced for television (Dream On, Brooklyn Bridge, L.A. Law, American Dreamer, Maximum Bob, First Wave, Third Watch, Canterbury’s Law, Smith, Law and Order: Criminal Intent, and NYPD Blue). Other writing includes Fire Free Zone, a book of comedic essays about writing and show business, and a novel, Three Girls and Their Brother. Ms. Rebeck has won numerous awards including the 2007 IRNE Award for Best New Play and the Eliot Norton Award for MAURITIUS. BOB KAPLAN (Director) enjoys acting and directing. Each presents different challenges; both are invigorating and humbling. He’s acted in THE PRICE and SIX DEGREES OF SEPARATION (here at HTC), EARLY ONE EVENING AT THE RAINBOW BAR AND GRILL, I HATE HAMLET, LAUGHTER ON THE 23RD FLOOR and THE HEIDI CHRONICLES. He has directed GLENGARRY GLEN ROSS and WAIT UNTIL DARK for the HTC, SYLVIA, FOREVER PLAID, PLAZA SUITE, SOCIAL SECURITY and MAN OF LA MANCHA. He also works with the Teeny Awards, a program that supports high school theater by presenting awards each year to deserving students. Thanks to his wife Betsy for being his most insightful critic and for continuing to understand his need to be involved in theater. SARAH HUNNEWELL (Producer) is thrilled to be a part of the Hampton Theatre Company’s 25th season. Greatest thanks to all those who have helped bring us to this point – June Ewing, James Ewing, Jane Stanton, Peter and Diana Marbury, all the company board members past and present, all our terrific volunteers, all the dozens of actors who have graced this stage, all our generous contributors, all the advertisers whose ads appear on these pages and those of previous playbills and, most or all, our wonderful and loyal audience members who provide our life blood. JAMES EWING (Set Design, Technical Director) founded the Hampton Theatre Company in 1984 and has since appeared in over 20 productions and built numerous sets, along with his dear friend Peter Marbury. He is so pleased that Peter’s son Sean has picked up the torch and continues the tradition of creating the stage worlds you see before you. MARY-ALYCE VIENNEAU (Set Decor, Properties) dressed the sets for the company’s productions of GLENGARRY GLEN ROSS, THE OLDEST LIVING GRADUATE, MOON OVER BUFFALO and THE ODD COUPLE, directed last season’s production of FROZEN and has appeared in numerous productions. When not in the theater, she runs her business, Mary’s Garden. JEAN PLITT (Stage Manager). Theater provides so many opportunities for creative expression, personal challenges and just plain fun that I could never call it “work! 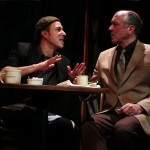 !” Additionally, this anniversary season for the Hampton Theatre Company will provide a chance for a walk down memory lane as well as involvement with such classics as PICNIC and ONE FLEW OVER THE CUCKOO’S NEST. I am excited to be involved with so many talented people. The worst part of any show is the closing curtain at the end of the run!! ROB DOWLING (Lighting & Sound Technician) has done lighting and sound effects for 18 years at the North Fork Community Theater, Vail-Leavitt Music Hall, Producer’s Club (NYC), the Loft Theater at Dowling College and the Southampton Cultural Center. This is Rob’s fourth season with the Hampton Theatre Company. He is very happy to be part of the show and the company. Mr. Mamet made his reputation with his thriller about a group of schemers after a valuable coin collection containing a rare buffalo nickel. Ms. Rebeck does the same for the philately industry by assembling a group of schemers lusting after a rare stamp from Mauritius, the small island in the Indian Ocean off the coast of Africa. 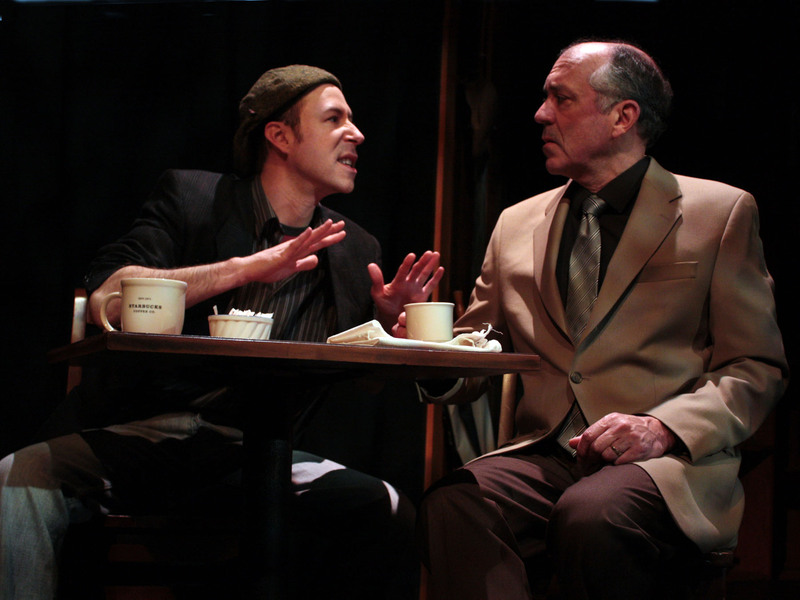 The ghost and influence of Mr. Mamet hangs heavy over more of Ms. Rebeck’s creation: in the sketchily drawn characters, who shoot their overlapping, sometimes fragmentary lines as if they carry machine guns in their vocal chords, and in their chosen language, which overflows with repeated and creative obscenities. In fact, in “Mauritius,” the angry delivery of a four-letter Anglo- Saxon verb that in modern usage has long since transcended its original role as a street description of copulation is pervasively present enough to become comic. 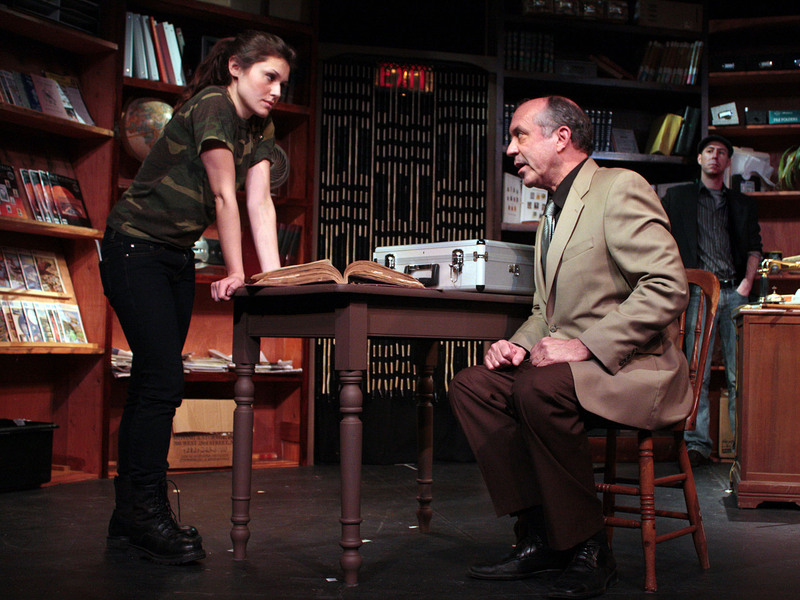 And maybe that’s what the playwright meant to do, for she has concocted a sometimes stunning, sometimes predictable thriller that never lets up on its convolutions or its suspense. Her dialogue is not only bright and brittle; it distinguishes character from character with lightning skill, and drives the plot forward without a gasp of a pause. And she exhibits, in the twists and turns and alleyways of her story, her television-honed skills, developed in writing highly convoluted cop dramas, among them NYPD Blue. In the HTC production, Bob Kaplan has directed a dynamic ensemble with the speed of a runaway Eurostar and the vigor of a young lover. 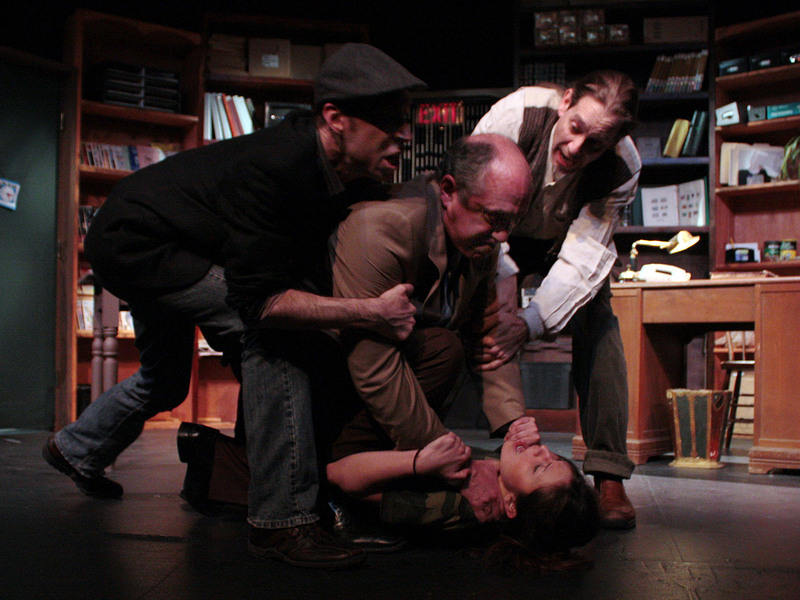 The five-person cast is dazzling and expert, keeping the action and the play as aloft as a leaf in a windstorm. 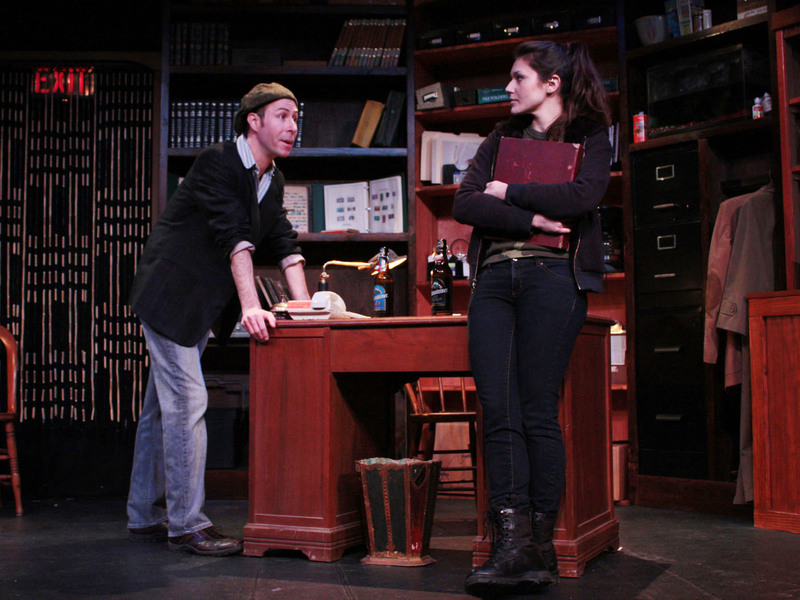 There’s a constantly renewing display of solid and exciting acting taking place onstage in Quogue; in fact, there are no supporting roles in this production; just starring ones. And this makes it an unalloyed and exciting theater experience. 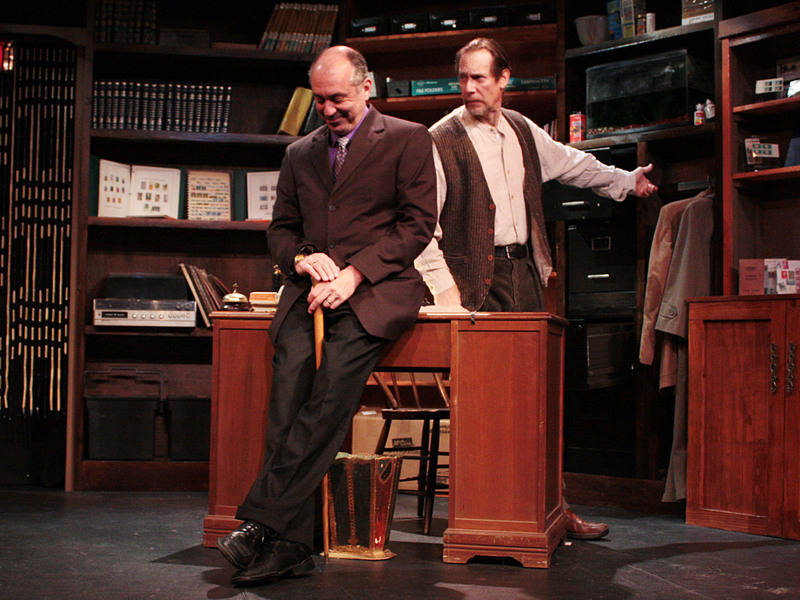 Christopher Linn brings his usual understated approach—and, believe me, understatement is a rarity in this play—to the character of Philip , the jaded, uncooperative, and private rare stamp expert around whom swirls, it seems, a vortex of conspiracy. It’s a strong, perceptive characterization. As Dennis, an ambitious, avaricious and dedicated novice at cheating, Eric Clavell brings a great talent for vigorously chatty portraiture. Two half sisters, Jackie (Joanna Howard) and Mary (Anna Hemphill) are as diverse as a sun and a moon. Mary left the household as a young woman, perhaps for self-preservation; Jackie stayed with their troubled mother through her agonizing final days. Their combat (everyone is at everyone’s throat in the story) comes from two perceptions of the ownership of the rare stamp collection their mom left behind. Anna Hemphill portrays Mary as the more mature of the two, but still motivated by very thinly disguised self-interest. It’s a satisfyingly affecting and controlled performance. As the wildly out of control Jackie, Joanna Howard delivers a powerful portrait of a young girl apparently trembling on the brink of falling apart. Wound tight as a watch spring on the interior, she carries the wild consequences of this, plus a maniacal concentration on some kind of compensation for what she has had to live through. A little muffled in the first act on opening night by projection problems, Ms. Howard, as she settles into the role, will only sharpen and define the intense parameters of her character. Even given her temporary audibility problem, she emerges as an actress who can, with the smallest change of facial expression, convey volumes of feeling. 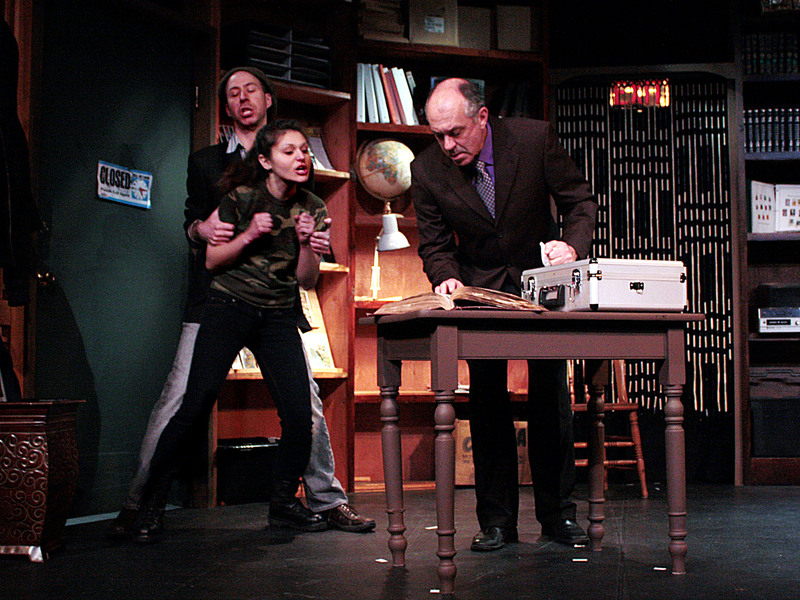 As Sterling, part tough, wealthy businessman and part scary sociopath (shades of Mr. Mamet again), Phil Eberhardt delivers a raging, vibrant performance that’s dazzling and unforgettable in its capturing of unabated and profound evil. Though no one in the play would qualify for admission to a convent or priesthood, Sterling just about fills the bill for entrance to the seventh ring of the inferno. Mr. Eberhardt’s astonishing skill lies in taking a character that’s given no history by the playwright and building a personality—albeit a distasteful one—that not only accelerates the speed of the production but gives it a heightened reality. Still, this is only a piece of a production that’s very much of a piece. The set, designed by James Ewing and Bob Kaplan and decorated to a stuffed fare-thee-well by Mary-Alyce Vienneau, is a masterpiece of visual storytelling and flexibility that allows the director to move the action between three venues with barely a breath of a pause. Sebastian Paczynski’s fluid and dramatic lighting design heightens and focuses the mood and content of the play, and Teresa LeBrun’s costumes are, as always, absolutely on target. “Mauritius,” despite its now and then lapses in logic and its cast populated by greed obsessed characters who become—in at least two cases—more and more unhinged as the play progresses, is, in its HTC incarnation, a crackling good evening of uninterrupted, highly realized entertainment. 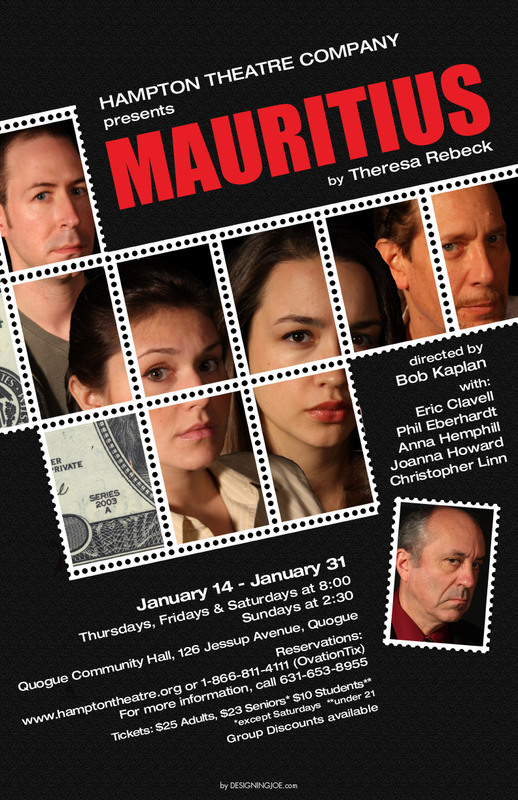 “Mauritius” continues at the Quogue Village Theater on Jessup Avenue on Thursday, Friday and Saturday nights at 8 and Sunday afternoons at 2:30 through January 31. Call 1-866-811-4111 or visit our TICKETS page for ticket reservations or call 631-653-8955 for more information. In the world of philately—stamp collecting to us amateurs—flaws mean riches. It works in drama, too. Nothing holds our attention so much as a flawed character. In Theresa Rebeck’s “Mauritius,” Jackie’s flaws are so apparent that a virtual stranger describes her as “damaged.” But the flaws that drive the action in this crackling noir thriller are a pair of misprinted stamps from the Indian Ocean island of Mauritius. These uncanceled 1- and 2-cent stamps are part of a collection bequeathed by Jackie’s mother. Trouble is, the collection may not have been hers to bequeath. Jackie’s half-sister, Mary, estranged from their mother, claims the stamps are hers alone in that they belonged to her paternal grandfather, Jackie’s step-grandparent and no blood relation. Nevertheless, Jackie takes the collection to a philatelist for appraisal. But he’s too grumpy even to look at them. Dennis, a stamp enthusiast hanging out in the shop, takes the trouble to peruse them – probably because he’d like to peruse Jackie herself. As played by Eric Clavell, Dennis is a vaguely shady sort whose eyes widen when he flips to the page where the Mauritius stamps are mounted. Keeping his cool, he says little and returns the book to Jackie and surreptitiously follows her home. Dropping in on the sisters later, Dennis arranges a meeting with a wealthy collector he’s already apprised of the situation. Sterling, the aptly named gangster-ish collector played by Phil Eberhardt with barely restrained ruthlessness, is prepared to turn over a suitcase stuffed with cash. The philatelist (a devious Christopher Linn) will authenticate them for a fee and, presumably, Jackie will be a wealthy young woman – assuming she can keep her sister (Anna Hemphill) one step behind. Joanna Howard as Jackie is the rare gem who elevates “Mauritius” from fusty stamp-collecting thriller to Mamet-esque psychological striptease. 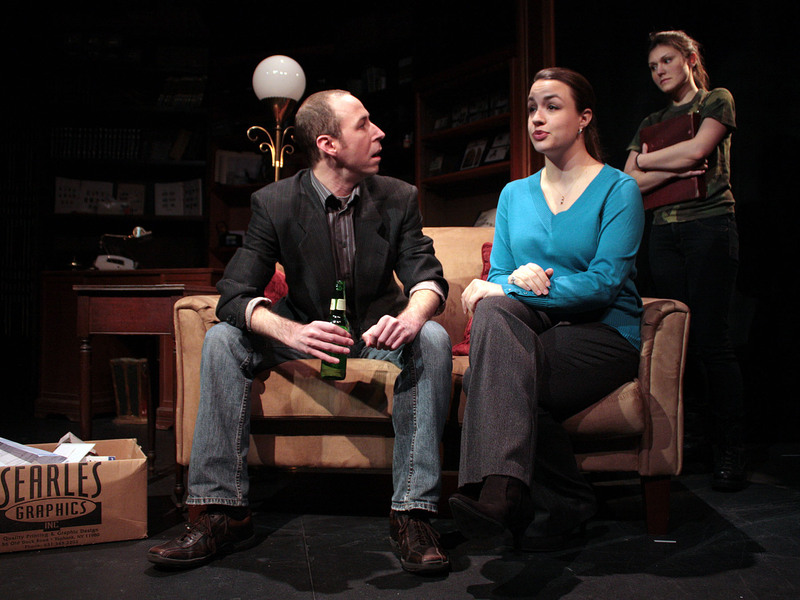 Howard bundles her character’s untold conflictions into combustible self-revelation. Director Bob Kaplan keeps the disparate, occasionally improbable comic threads moving inexorably on his and James Ewing’s claustrophobic, pack-rat set. You can stamp this “Mauritius” delivered. At the invitation of dramaturgy professor and Ancient Greek Theatre scholar Dr. Michael X. Zelenak, I first met Rebeck in 2004 at a reception he asked me to Master-of-Ceremonies host celebrating the nomination of Rebeck’s “Omnium Gatherum” for the Pulitzer Prize (Co-written with Alexandra Gersten-Vassilaros). He told me, “Rebeck is one of the most brilliant contemporary woman playwrights in America.” “Mauritius” is a play about sibling betrayal, personal greed and philatelic obsession that had a limited run on Broadway at the Biltmore Theater in 2007 starring F. Murray Abraham and garnered a Tony nomination for Bobby Cannavale. In short, the play is about two estranged half sisters, the elder who walked away from a dysfunctional family situation and the younger that was left behind to carry the load. Reunited at their mother’s death, the younger daughter wants to sell a stamp collection, which in truth was left to her sister, for a chance at a new life. Throw in a disillusioned stamp store owner and philatelic expert, a wealthy but shady stamp collector and a charming con man who tries to facilitate the deal. 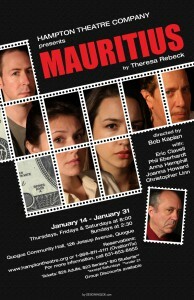 I do not know if “Mauritius” is Rebeck’s intentional homage to playwright David Mamet, but there are undeniable similarities to his play “American Buffalo.” Also Rebeck, like Mamet, is not shy about infusing her dialogue with real language, in other words a healthy dose of appropriate profanity. As I noted earlier the Hampton Theatre Company is the exception to rule when it comes to production values at their venue. 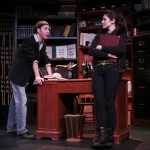 The set, designed by James Ewing and Bob Kaplan, is perfectly constructed to recreate a stamp shop on the small stage of the Quogue Community Hall. Lighting Designer Sebastian Paczynski facilitates the downstage atmospheric scene changes from stamp shop to an apartment to a coffee shop with the upstage set almost disappearing or at the very least a non-distraction to the ensuing scenes. 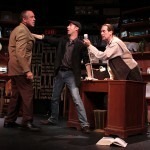 Kaplan also directed the production and did a spot-on job staging the pace and movement of his actors. Beyond the immediate plot of the play, there are expositional sub-plots that Rebeck alludes to but does not detail within the dialogue. This creates combinations of relationships between specific pairs of characters within the ensemble, namely between the two stepsisters Jackie and Mary and between the collector Sterling and stamp store owner/expert Philip. Kaplan has succeeded in creating the tension of past events, without necessarily having all the details available. Well done indeed! The casting was perfect, particularly Joanna Howard as Jackie and Anna Hemphill as Mary, the pair could literally pass as real sisters in physical characteristics. The acting was superb throughout. My old friend Christopher Linn displayed his usual perfectly understated ability as the disillusioned stamp store owner, which balanced the brilliantly volatile and highly charged performance of Phil Eberhardt as the obsessive and threatening stamp collector. Howard and Hemphill brought to the stage a very real and sad portrayal of two sisters irreparably wounded by a dysfunctional family that has created an emotional canyon between them that can never be bridged. Hemphill’s performance was reserved and subtle as the dismissive, unemotional older sister and Howard simply shined in the role of the emotionally damaged younger sister that was left behind. Her performance called for wide swings of emotional panic, self-serving manipulation and personal desperation. Not an easy task, but extremely well done by this gifted young actress. The thread running through all the characters of “Mauritus” and the plot catalysis is the con man Dennis who is trying to make his own life right by arranging the stamp deal of a lifetime. Actor Eric Clavell’s portrayal was funny, charming and perfectly paced. He at once created a character that was both self-serving, yet genuinely endearing with perfect comic timing. The moments between Howard and Clavell on stage represent many of the highlights of this entirely enjoyable and extremely well acted ensemble production. The Hampton Theatre Company’s shining production of “Mauritius” is must-see theatre during these dark, cold days of our East End winter.